Have some games below for trade. 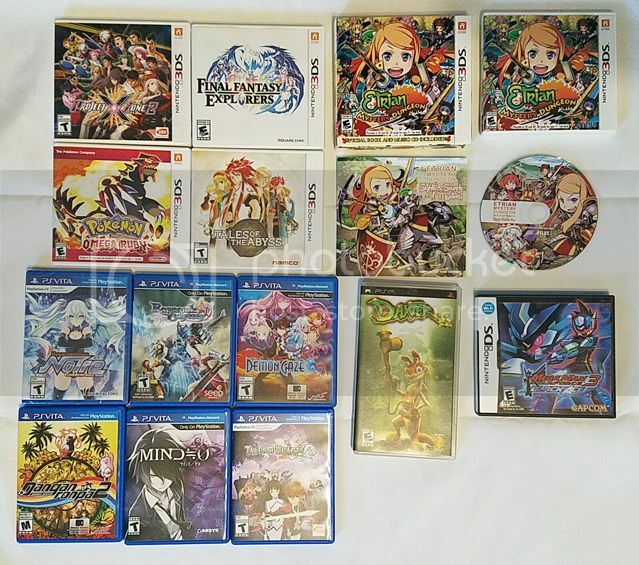 All are complete unless noted, except Vita and 3DS games originally do not come with manuals. I am willing to check lists. I'm interested in your 3DS stuff. Check my list and see if there's anything you'd like, thank you. SilverOwl - Didn't see anything this time. tonymack21 - Didn't see anything this time. Cevil & NeonTrotsky - Sorry didn't see anything. SilverOwl - Didn't see anything this time. tonymack21 - Didn't see anything this time. Cevil & NeonTrotsky - Sorry didn't see anything. I'm interested in Danganronpa 2. Would you trade for a sealed Bit Trip Runner 2 for Vita?